As a busy mom, we all know the importance of me time, and so does Softsoap. They like to think about showering as a moment of renewal and a time to hit refresh during our day. Whether it’s baking your favorite dish, spending an hour at the gym, reading a book, or indulging in a hot shower, every moment spent on yourself is a way to relax and recharge. 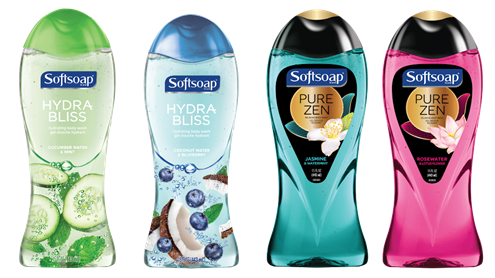 To inspire you, Softsoap just released the latest body wash collection including Hydra Bliss Hydrating Body Wash and Pure Zen Relaxing Body Wash, each crafted with me time in mind. Please let me know if this is something you are interested in. These four varieties of Softsoap Body Wash are just awesome! I tried them all, and it's hard to pick a favorite. They each have their own unique advantages. Here is a little about each one. Coconut Water & Blueberry - This fruity combo will make you feel like you're escaping to an exotic island. It leaves you feeling refreshed and ready to start your day. Jasmine & Watermint - The sweet sent of jasmine is relaxing, while the watermint makes you feel invigorated. Rosewater & Lotus Flower - Rosewater is great for your skin and keeps it healthy. The lotus flower adds a spring-like scent that will remind you spring is on the way. I enjoyed all these products and have been switching back and forth between them when I shower. Even the bottles with their bright colors and designs are uplifting and original. SoftSoap is an affordable way to get a spa experience right in your own home. So stock up and keep that fresh clean feeling with you all day long with a little help from Softsoap You can find these fun products in retailers nationwide including but not limited to Walmart, Target, and K-mart. To learn more about Softsoap and all the have to offer, be sure to visit their website or follow them on face book.